The tax liability on your property depends on whether you are letting the property out on a permanent basis or just for a holiday home – and also if you are living in the property yourself and renting out a part of it to another person or people as a lodger. If you let the property as a home for another person in its entirety, it’s classified as a residential letting, and if you rent out part of your own home to take in lodgers, although it counts as a residential letting, you have a tax free allowance under the government’s 'Rent a Room' scheme which gives you the opportunity to keep up to £4,250 tax free. How Much Do I Pay Tax On? For residential lettings, you only pay tax on your net profit. You can work out how much this is by adding up your annual rental income and your 'allowable expenses' and then taking the expenses away from the income. If your property is furnished you can also deduct either an allowance for wear and tear which is based on the amount you charge for rent, or what’s called a renewals allowance which is just the cost of replacing old household furniture and items with new. How Do I Pay My Tax? If you're employed in another job as well as being a landlord, or if you’re currently in receipt of a pension through PAYE, and if the taxable income that you make on your property is less than £2,500, you can arrange to pay the tax due for rentals through PAYE. You should contact your local Tax Office and ask for form P810 which you can then fill out and use to report your taxable income every year. If the above doesn’t apply, you’ll have to fill in a Self Assessment tax return.If you make more that £15,000 from property in the UK in one tax year you have to declare this income in the land and property section of a Self Assessment tax return. If the amount you make is under £15,000 you might be able to use a four-page return. 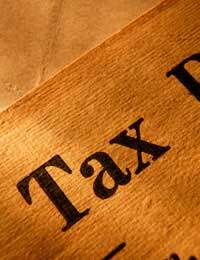 Ask your local tax office for advice on your own individual circumstances if you’re unsure. If you complete the full return, you’ll probably find that it’s easier to complete it online. As you complete the return the form adds all the figures for you – and you get longer to file the return if you do it electronically. There are notes on the website that help you complete the forms. If you have another job as well as being a landlord, taxable profits that you make from letting out your property are added to your overall income. You pay the normal rates of income tax on this, as if it were another job. If you let your property with another person, you must show your share of the income received from the property when you fill in your tax returns. You should also include your share of the expenses relating to it, any profits or losses. What Paperwork Should I Keep?